Alain Resnais’ Last Year At Marienbad, released in 1961, explored the nature of memory and dreams against the backdrop of an elegant château and its grounds. John Huston’s The List of Adrian Messenger, released in 1963, featured George C Scott as a retired MI5 agent investigating a series of apparently accidental deaths; several famous actors, including Kirk Douglas and Burt Lancaster, appeared heavily disguised by make-up, which they removed at the end of the film to reveal themselves. The opening scene of From Russia With Love concludes with the revelation that the dead James Bond is in fact another man wearing a mask, and we realize we have witnessed a gruesome murder by an organization training to kill 007. Despite feeling Resnais’ film was pretentious, Young was nevertheless influenced by it. As well as drawing us into an opulent and elegant world, the opening scene of From Russia With Love is also, like Last Year At Marienbad, puzzling, eerie and dream-like. Dreams often consist of compelling and vivid episodes: we’ve all woken feeling as though we have just experienced some amazingly intricate adventure in which we were pursued by unseen forces, one person suddenly became another, and so on. The opening of From Russia With Love has something of that feeling and, as with a dream, it’s only after it’s over that we realize it didn’t make any sense. If an organization wanted to train to kill James Bond, they probably wouldn’t go to the trouble and expense of creating incredibly lifelike masks to put on sacrifical human targets. And why stalk someone who looks like Bond through the gardens of a country house when, judging from the rest of the film, they have no intention of trying to trap Bond in such a place? But even if we recognize these logical flaws, they don’t overly bother us. This is clearly not the sort of training exercise any organization would undertake in real life, but it’s not meant to be a realistic portrayal of espionage. It’s a fantasy, and it uses dream logic – or film logic. The opening of From Russia With Love helped establish the often fantastic atmosphere of the Bond films, and proved influential in its own right – Mission: Impossible, which made its debut on US TV two years later, frequently featured lifelike masks being peeled off by secret agents, in a kind of repeated variation of the shock that comes at the end of this scene. Q. What do you think that means? Influence, then, can be hard to pin down and at several removes, or it can be hard to miss. 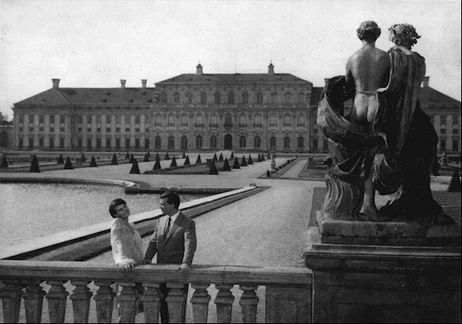 Colin Bennett was right that From Russia From With Love was directly influenced by Last Year At Marienbad – Terence Young confirmed it. We don’t know whether or not The List of Adrian Messenger was also an influence. Critics who felt Inception was directly influenced by Last Year At Marienbad were wrong, but those who felt there were references to On Her Majesty’s Secret Service were right. In the latter case, the similarities are not just thematic, but precise. 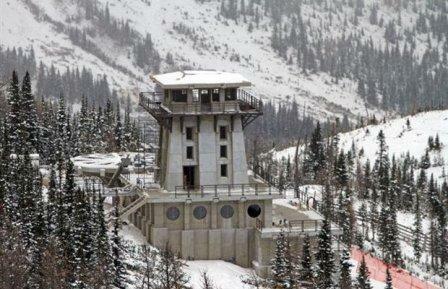 As in the finale of On Her Majesty’s Secret Service, the characters in Inception storm a clinic that is more like a fortress, positioned on a snowy mountainside. The accompanying music, costumes and other details all make the connection explicit. An even clearer example of influence occurs later in From Russia With Love, in the scene in which James Bond is chased across a barren stretch of country by a low-flying helicopter. He tries to head for shelter, but as the helicopter passes over him he flattens himself on the ground. 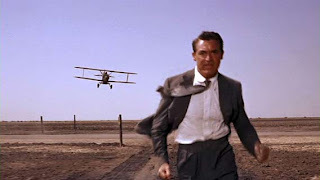 Terence Young also confirmed that this was a ‘steal’ from the famous crop-dusting scene in North By Northwest 2, but we hardly need proof: common sense tells us it must be. The situation is a little similar with Ian Fleming’s novels. In some cases, we know what Fleming’s influences were because he remarked on them. In others, we can guess he was inspired by other works, but have no confirmation of it. Our guess may be a very plausible one, but still be incorrect. But sometimes the level of correspondence is so high that proof is not needed, and common sense will do. But why focus on influence at all? Does it make any difference who was inspired by whom? Not always, no. We can just sit back and enjoy the story. If it works, who cares what inspired it? But if we want to examine Ian Fleming’s place in the literary canon, yes, his influences matter. There are also degrees of influence. The scene with the helicopter chasing Bond in From Russia With Love is a direct reference to North By Northwest. The opening scene, on the other hand, is relatively lightly influenced by Last Year At Marienbad. Influence can be more general still. 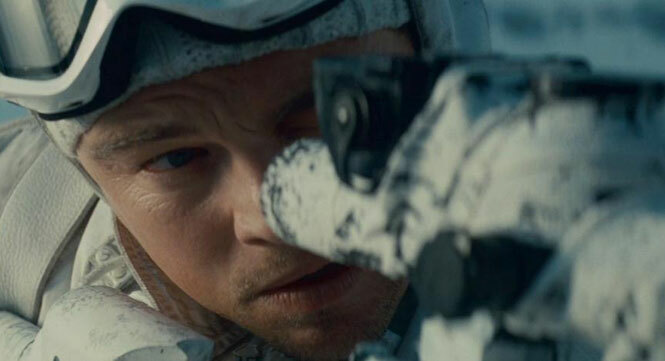 Inception features a scene in which the protagonist, Cobb, is being chased through the streets of Mombasa by men shooting at him. He finds a side street and runs down it. He slams against a wall and realizes it is part of a narrower alleyway, which he heads down. It narrows further, becoming impossibly tight, the walls seeming to close in on him. He pushes against them desperately as the men behind him gain ground, finally managing to squeeze his way through. I don’t think this is inspired by anything in particular. It’s simply a convention that is often seen in thrillers, and I doubt anyone knows who originated it. In my last post, Bloods Line, I discussed Sexton Blake, and this convention can be seen in the 1968 comic strip Sexton Blake and The Museum of Fear. Inception features dreams that echo films – the scenes inspired by On Her Majesty’s Secret Service – but I think the narrowing alleyway scene in Mombasa is a feedback loop: a dream sequence reminiscent of thrillers reminiscent of dreams… Where you start the loop can change your interpretation of the film. Great thrillers don’t simply recycle conventions in a mechanistic working through of plot: they use them to tap into deeper concerns and emotions. I think one purpose of this scene may be to suggest (or perhaps implant) the idea that, just as cinematic and fictional conventions often echo our dreams, perhaps our dreams are also affected by fictional archetypes. Influence can flow in unexpected directions, which make it harder to untangle. 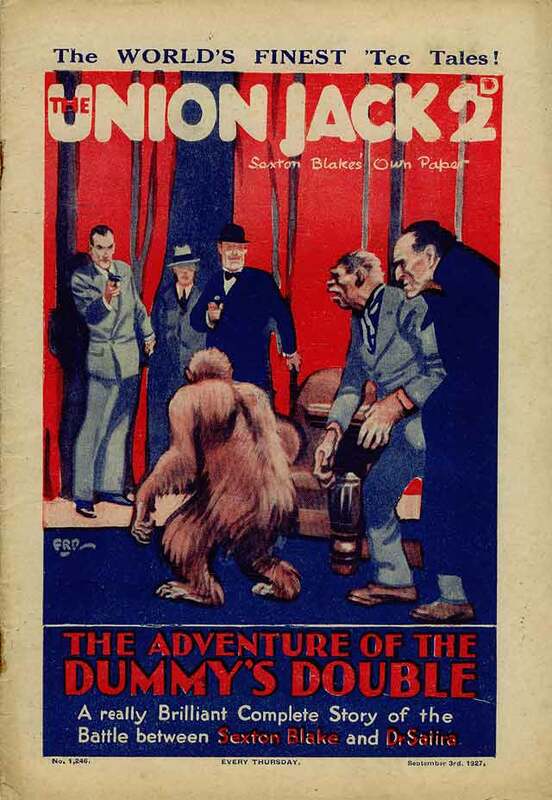 Sexton Blake and other characters in the penny dreadfuls led to the likes of Dan Dare – the success of which probably influenced the ongoing Sexton Blake series. The same can be said of James Bond. Once Bond became successful, several characters that predated Fleming’s novels – including Sexton Blake – were either repackaged or completely updated to jump on the bandwagon. This can be seen with Jean Bruce’s OSS 117, Leslie Charteris’ The Saint, Sapper’s Bulldog Drummond and many others. 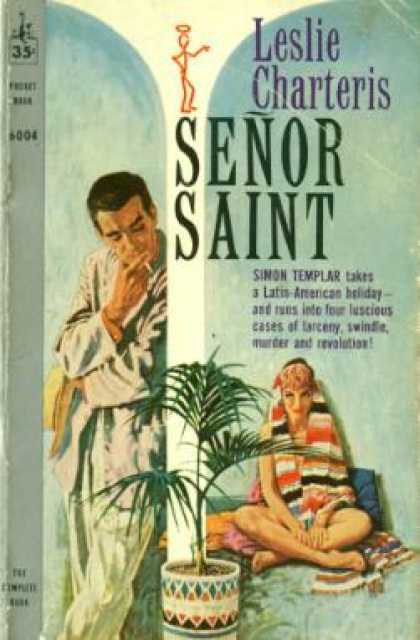 Roger Moore played The Saint before he played James Bond; coupled with that TV series’ increased aping of the Bond films, the impression is that Simon Templar is a character imitative of James Bond, when the reverse may be true. Influence is not always cut and dried, and can be difficult to trace, but that doesn’t mean it should be ignored. Exploring it sensibly can open up our perceptions of what individual works have to say, and how fiction works in broader terms. All of which brings me to White Eagles Over Serbia. M raised ironic eyebrows at Bond. Bond smiled thinly. Bond took off his coat and slipped off the chamois leather holster and harness. He put his coat on again. Boothroyd recommends Bond use a Walther PPK 7.65 mm. or Smith & Wesson Centennial Airweight Revolver .38, and gives a lot of information about both. In May 1956, gun enthusiast Geoffrey Boothroyd wrote to Fleming suggesting that Bond change weapons from the ladylike Beretta to a Walther PPK. 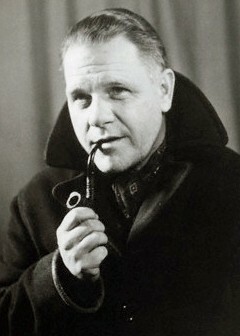 Fleming replied that he appreciated the advice and proposed changing Bond’s weapon in the next book he wrote, adding ‘I think M. should advise him to make a change’.8 He didn’t specify that he would create an armourer character, or name him after Boothroyd, but the idea seems a natural enough way to introduce the change. But there are still some intriguingly close similarities between these two scenes. Both Henslowe the artificer and Boothroyd the armourer are condescending towards the agent they are fitting out: Henslowe has ‘the air of a haberdasher finding the right size of neck and wrist for a man of unusual shape’, while Boothroyd speaks in ‘the sort of voice Bond’s first expensive tailor had used’. This seems natural now, but upper-class Brits discussing lethal weapons as though they are bespoke clothing items is a convention we usually date to the Bond series, and particularly the films. In some ways, Durrell’s scene is more reminiscent of a Bond film than Fleming’s: Methuen’s nonchalance about having lost his previous weapon while conducting his most recent mission and Henslowe’s anxiety that he might lose the costly experimental weapon he is now giving him would become staples of the scenes between Bond and Q in the films. Fleming started writing Dr No in January 1957, but it wasn’t published until March 1958, several months after White Eagles Over Serbia. Fleming might, then, have read Durrell’s novel as he was writing or editing Dr No. I think it’s plausible it would have been on his radar. 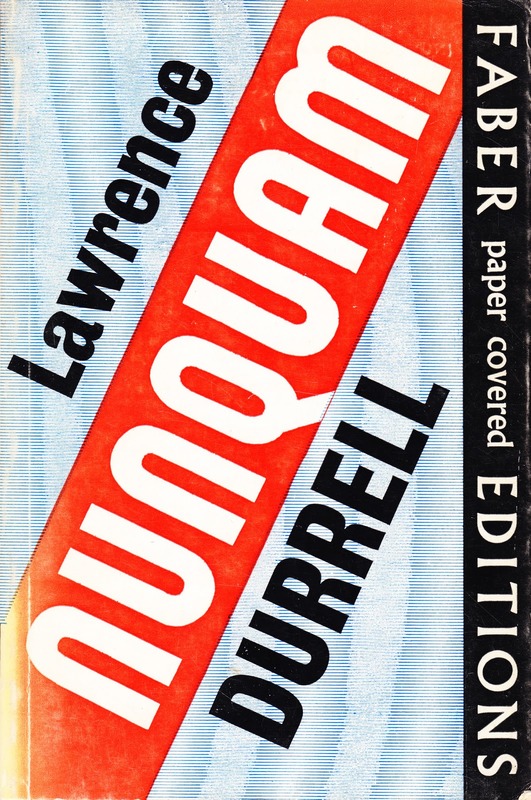 As well as having worked in several countries as a British diplomat and intelligence officer, Durrell was a well-established poet, novelist and travel writer, and this was a well-reviewed adventure story about the British secret services, a throwback to the sorts of novel Fleming had enjoyed as a boy. Durrell was one of the closest friends of the travel writer Patrick Leigh Fermor, who was also a friend of Fleming’s, and who had written part of his first book, The Traveller’s Tree, at Fleming’s house in Jamaica in 1948. But all this is guess-work. As far as I know, Ian Fleming never mentioned Lawrence Durrell’s book as an inspiration in any interviews or correspondence, and the similarities between the scenes, while numerous, are not close enough to be a ‘smoking gun’, with or without experimental silencer. It may simply be coincidence or, perhaps more likely, that Durrell and Fleming were both inspired by similar scenes in earlier thrillers. 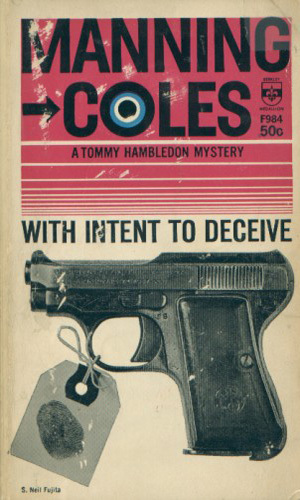 I’m not aware of any prior to 1957 that involve a weapons expert picking out a pistol for a secret agent’s forthcoming mission, but there are lots of thrillers I haven’t read or seen. Suggestions gratefully received. Regardless, the scene in White Eagles Over Serbia tells us several things. Most obviously, it tells us that Ian Fleming did not create this particular convention, which we might otherwise have thought he did. Durrell may not have originated it, either, but we know Fleming didn’t. It also shows how influence diverges and takes new shapes. Durrell’s scene was itself a variation of a more general and well-established convention, that of ‘preparing before setting off for an adventure’. Erskine Childers’ The Riddle of the Sands, for example, published in 1903, opens with Foreign Office official Carruthers being contacted by an old acquaintance, Davies, and asked to join him on a sailing trip. Carruthers duly runs around London collecting equipment Davies has specified he bring along. This can be seen in several early British adventure stories involving exploration. Durrell’s and Fleming’s scenes are a more specific version of that convention; a secret agent being assigned a weapon by an expert. Ie, not just a man being shot at, but a man being shot at from above by a low-flying craft while he runs across barren countryside. White Eagles Over Serbia is a love letter to the British adventure story, but while the plot is reminiscent of John Buchan and Rider Haggard, the romance is occasionally sprinkled with a dry and melancholic tone more akin to Somerset Maugham or Graham Greene. 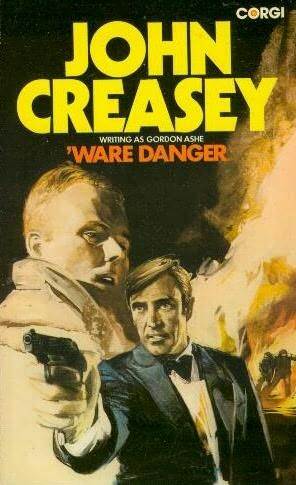 In a general sense, the same could be said of the Bond novels, but both sets of influences are much weaker. Durrell and Fleming were drawing on some of the same influences, but developed a very different mixture. Finally, these two scenes may be an example of influence turning inward on itself. The armourer Major Boothroyd didn’t appear in any other Fleming novels, but he did appear in a similar scene to this in the film of Dr No. In subsequent films, he was played by Desmond Llewellyn, and became known as Q. Instead of simply being an armourer, he was now head of the Q Branch mentioned but never seen in Fleming’s novels, responsible not just for providing Bond with weaponry, but also a range of ingenious equipment. The convention took on a new form with the films, then, and hundreds of thrillers followed with dotty inventors kitting out spies with outrageous gadgets. 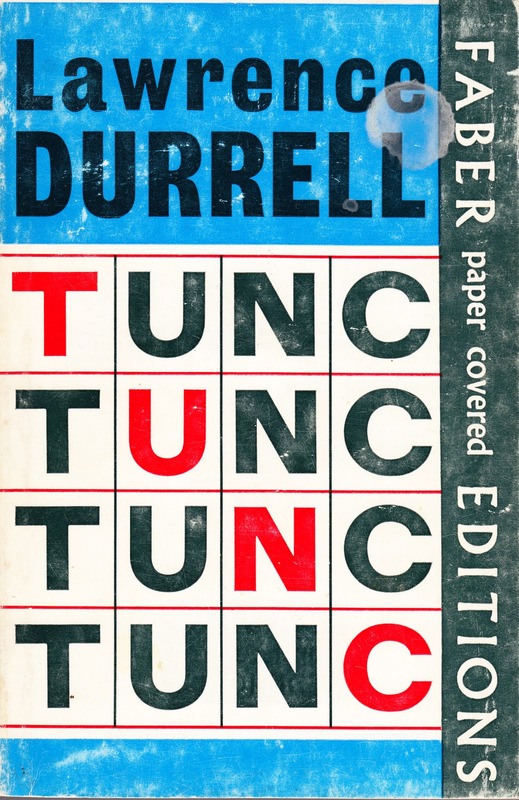 In 1968, Lawrence Durrell published Tunc, which featured Felix Charlock, an inventor who works for the sinister international conglomerate Merlin, sometimes known as ‘The Firm’. Charlock goes on the run; trying to bring him back is Merlin’s shadowy director, Julian, who Charlock has never seen. The sequel, Nunquam, published in 1970, opens with Charlock in a luxurious but anonymous sanatorium-prison in the Swiss Alps. He is released by The Firm and finally meets Julian, for whom he builds a lifelike robot, a perfect replica of a beautiful dead actress with whom Julian is obsessed. The robot also rebels, wreaking havoc and destruction. Perhaps these novels were influenced directly by Bond or perhaps, as with Inception and Last Year At Marienbad, by other thrillers that were influenced by Bond. But it may also be that Lawrence Durrell influenced Ian Fleming directly in 1957, only to be influenced by Fleming himself a decade later. 1. ‘Thrills and Tricks’ by Colin Bennett, The Age, April 25 1964. 2. From Russia With Love audio commentary, Criterion Collection, Laserdisc, 1991. 3. ‘A Man and His Dream: Christopher Nolan and ‘Inception’’ by Dave Itzkoff, The New York Times, June 30 2010. 4. ‘Crime Of The Century’ by Dan Jolin, Empire, July 2010. 5. Hitchcock s’explique, Cinéma Cinémas, directed by André Labarthe, 1965. 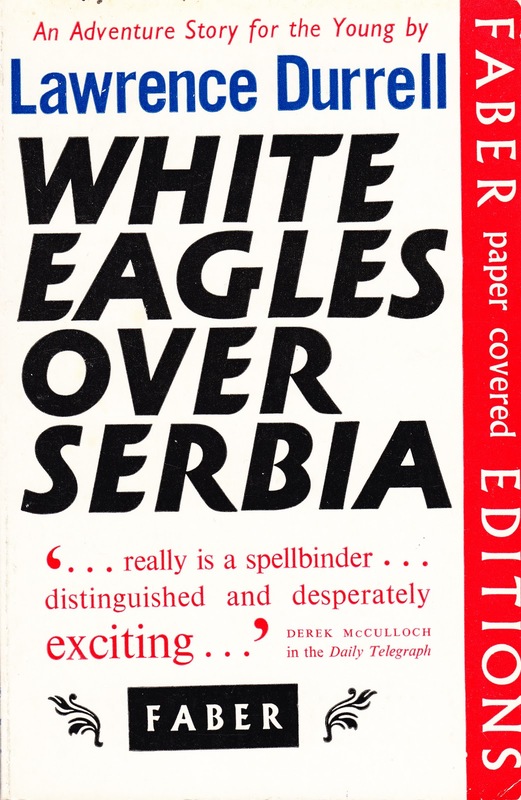 6. pp27-28 White Eagles Over Serbia by Lawrence Durrell, Faber, 1957. 7. pp18-19 Dr No by Ian Fleming, Pan, 1965. 9. pp644-645 MI6: The History of the Secret Intelligence Service 1909-1949 by Keith Jeffery (Bloomsbury, 2010). 10. p81, British intelligence, strategy, and the cold war, 1945-51 by Richard James Aldrich (Routledge, 1992). 11. 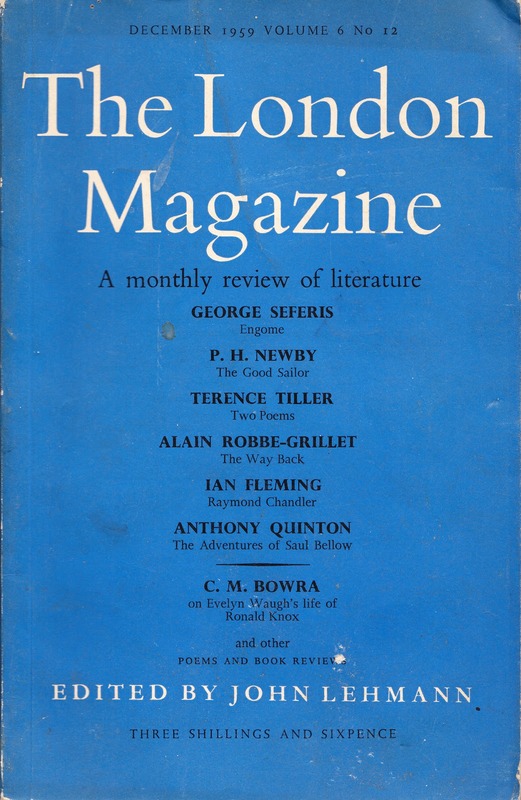 Kirkus Reviews, March 25 1968; p228, Journal de l’année, Larousse, 1971; ‘Dance of Seven Veils’ by Benedict Nightingale, The Observer, March 22 1970. This is part of 007 In Depth, a series of articles on Ian Fleming and James Bond. But despite creating one of the most iconic characters of the 20th century, Fleming has not joined the ranks of those widely regarded as having written ‘thrillers designed to be read as literature’. I say ‘despite’, but perhaps ‘because’ is more accurate. The unprecedented and sustained international popularity of the James Bond films has, I think, triggered in some critics an aversion to taking Fleming’s work seriously, partly through a desire to tear down success –Tall Poppy Syndrome – and partly through laziness. In 2002, I interviewed the American thriller-writer Donald Hamilton, creator of the character Matt Helm. He told me how film producers had originally intended to make faithful adaptations of his novels, but when Dean Martin expressed an interest Hamilton was asked if he were willing to sacrifice fidelity to his work for a lot more money. Hamilton said that he felt he had already put in the work in the novels, and so chose long-term financial security. Perhaps that was the right choice for him, and hindsight is 20/20, but the result has been that the public’s image of Matt Helm today is of a character from a few half-forgotten spy spoofs from the Sixties, while Hamilton’s stark and taut thrillers, which in my view deserve to be seen as classics of the genre, have been all but completely forgotten. The differences between Fleming’s novels and the Bond films are not as great as between Donald Hamilton’s books and the films of them, but I think there has been a somewhat similar result: the cinematic James Bond has come to dominate perceptions of both the character and of Fleming’s work. It has been commonplace for decades for writers to disparage the Bond novels while making reference to elements that only appear in the films. As I will explore in a later post, I think some influential critics have also deliberately sought to sabotage Fleming’s literary reputation – and succeeded. As well as eclipsing Fleming’s novels, the Bond films have dominated the thriller since the 1960s, to the extent that critics appear to have suffered collective amnesia about the state of the genre prior to James Bond’s arrival on the scene. As I discussed in my last posts in this series, Conventional Thinking and A Carton of Old Hatstand Crackers, a handful of writers have been erroneously identified as Fleming’s key influences, with little evidence given in support, and their names repeated in dozens of articles, essays, documentaries and books about James Bond over the years. The context of the thriller before the publication of Casino Royale in 1953 has largely been glossed over, and as a result the current critical consensus on Fleming’s position within the genre is, in my view, badly flawed. ‘Bloods’ were the penny bloods, which were called ‘penny awfuls’ and ‘penny dreadfuls’ by their critics. They emerged in Britain in the 1830s, and featured lurid retellings of classic tales of highwaymen and famous criminals, as well as new stories about similar topics. They sold for a penny, and they sold in their millions. In 1879, they were joined by the Boys’ Own Paper, and a rash of similar publications aimed at children and adolescents followed. In 1893, Arthur Harmsworth created The Halfpenny Marvel as a morally upstanding alternative to the bloods. This and other Harmsworth publications, such as The Union Jack and Pluck, were rapidly nicknamed ‘ha’penny dreadfullers’, and soon became indistinguishable from the papers they had been intended to displace. As well as gothic and gruesome stories, penny bloods featured a lot of crime fiction. Edgar Allan Poe’s detective C. Auguste Dupin had first appeared in 1841, and was a major influence on Arthur Conan Doyle’s Sherlock Holmes, who debuted in 1887. Inspired by the ‘dime novel’ in the United States, as the 20th century began penny bloods increasingly featured intrepid heroes uncovering wide-ranging plots by dastardly foreigners. The heroes were often detectives, policemen, secret agents or amateur adventurers, and sometimes these roles were blurred. 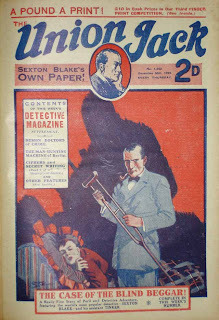 The “prince of the penny dreadfuls” was the detective Sexton Blake. 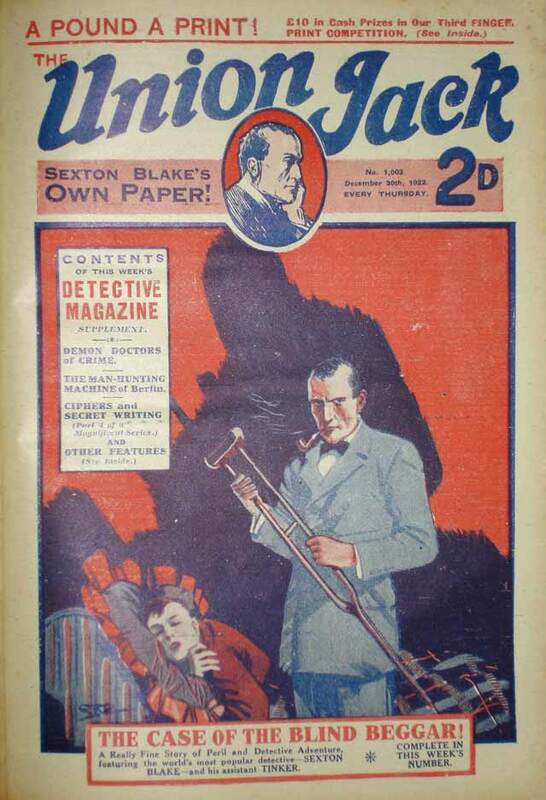 Created by Henry Blyth and first appearing in The Halfpenny Marvel in 1893, Blake went on to be featured in stories in The Union Jack, The Penny Popular, Penny Pictorial, The Boys’ Friend, Detective Weekly, The Thriller, Knock-Out, and even had his own magazine, The Sexton Blake Library. Blake is one of the most successful and long-running fictional characters in the English language, with more than 3,000 stories about him having been written by over 200 authors. Although Blake was initially rather a different character from Sherlock Holmes, he soon began to resemble him, including living in Baker Street. But the Blake stories usually placed much more emphasis on physical derring-do than Conan Doyle’s. While Professor Moriarty, ‘the Napoleon of Crime’, was one of fiction’s earliest super-villains, Blake – along with his boy assistant Tinker – took on dozens of such characters. These included Dr Ferraro, who threatens to blow up London if he is not paid a million pounds, Dr Satira, who lords it over a tribe of missing links and is assisted by a dwarf, and Monsieur Zenith, a ‘crimson-eyed’ albino who always wore immaculate evening dress. ‘Sexton Blake was a brave man, and his courage did not desert him. But well he knew that he had walked into a death-trap, and that no mercy would be shown. His suspicions had been correct, after all. The pets, of course, turn out to be tigers, kept in an underground chamber of Pershad Jung’s palace. Blake also battled criminal syndicates. In The Yellow Tiger, published in 1915 in the first issue of The Sexton Blake Library, Blake is employed by the Secret Service after the Munitons Minister is kidnapped from a golf course in Devon by Prince Wu Ling, an Oriental criminal mastermind working for Germany. Blake discovers that Wu Ling, head of The Brotherhood of The Yellow Beetle, is in league with the Council of Eleven, an organisation run entirely for profit and who were earlier foes of Blake. In The Yellow Tiger, Blake flies a Moth monoplane he has designed and built himself, and which he calls The Grey Panther. In the 1920s, Blake would drive a bullet-proof Rolls Royce Silver Ghost with the same nickname. In March 1939, a new comic book appeared, Knock-Out, and Blake featured in it from the first issue. The first strip, Sexton Blake and The Hooded Stranger, saw him working on behalf of the British Secret Service to disrupt a plot by the eponymous villain to arm a dictator’s air force with a new super bomber. The dictator, General Bomgas, operates from a massive tank that travels underwater and from a secret island called, well, The Secret Island, which is home to a huge armaments base hidden inside a crater. Having defeated The Hooded Stranger and General Bomgas, Blake was put on a more formal footing with the intelligence services, who were by now engaged in a real war against a real dictator. Blake’s next adventure in Knock-Out, beginning in December 1939, was titled Sexton Blake on Secret Service, and dealt with stolen submarines, secret Nazi weapons and the machinations of ‘Germany’s master spy’ The Penguin. After the war, Blake continued his adventures in Knock-Out, chasing down villains by jumping out of aeroplanes or steering them off the road in sports cars. As the Knock-Out series progressed, it featured a larger dose of science fiction and supernatural elements, with several ‘lost city’ stories harking back to the 19th-century adventures of Jules Verne and Rider Haggard. Blake’s appearance also changed: in The Hooded Stranger, he had the long face, receding hairline and aquiline nose familiar to illustrations from the Halfpenny Marvel, but as a secret agent Blake was much more conventionally handsome. 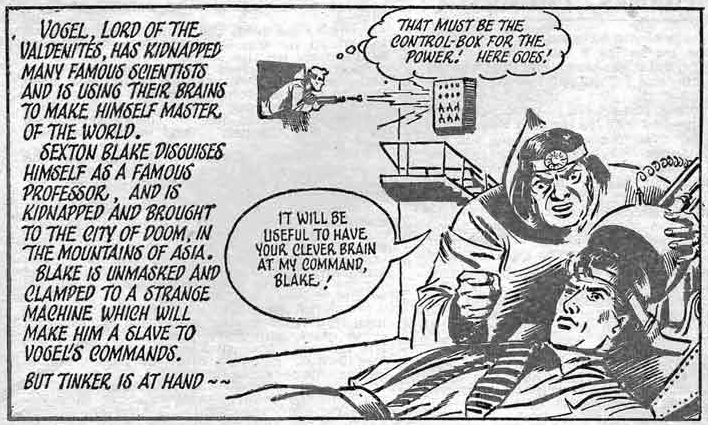 In 1952, the year before the publication of the first Bond novel, Blake featured in a Knock-Out strip titled Sexton Blake and The City of Doom, in which he and Tinker travel to a city hidden within a remote mountain in Asia, where they suspect brilliant scientists have been kidnapped by a crazed villain called Vogel. Eavesdropping on a discussion in Vogel’s conference room, Blake discovers he is using the scientists as slave labour to create atomic weapons, with which he will issue an ultimatum to the world. 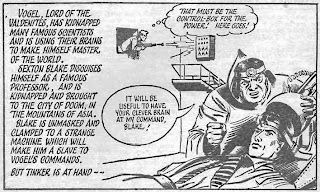 Vogel unmasks Blake (he was posing as a scientist) and straps him to a machine in his laboratory that will turn him into his slave along with the others. ‘It will be useful to have your clever brain at my command, Blake!’ he says. 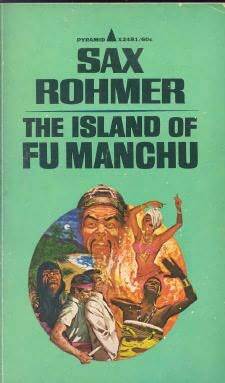 Ian Fleming may not have read this particular story, but he had probably read many like it, and elements similar to it can be found in Moonraker, Dr No and Goldfinger. There is no evidence that Fleming read any Sexton Blake stories, but considering his reference to penny dreadfuls influencing his work it seems hard to imagine he hadn’t come across the prince of them. The Blake stories were often highly derivative of other writers, some of whom were, I think, more of a direct influence on Fleming. But even before John Buchan, Sapper or Dornford Yates had become best-selling authors, many of the conventions that can be seen in the James Bond novels were being played out every week to an audience of millions in stories about Sexton Blake and others, in the ‘bloods of those days’. 1. Raymond Chandler by Ian Fleming, The London Magazine, December 1959. 2. How to Write a Thriller by Ian Fleming, p59 Show, August 1962. 3. Counterpoint by Roy Newquist, Rand McNally, 1964. 4. ‘The Writer Speaks’, Ian Fleming and William Plomer, 1962, courtesy the Archives and Special Collections, Durham University Library. For more information about this interview, see my earlier post in this series, William Plomer Interviews Ian Fleming, 1962. 5. 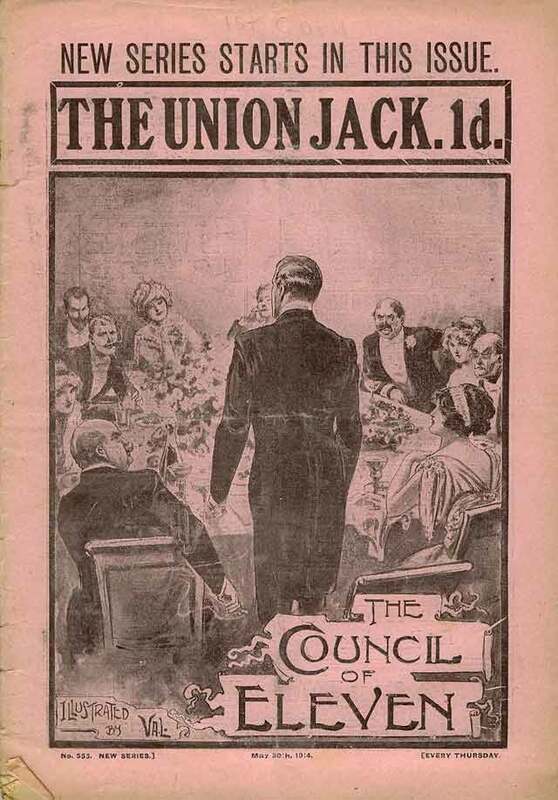 The Jungle Boy, Union Jack, Volume 4 Issue 85, May 27 1905, Amalgamated Press.